Oregon is a key player in the breeding and production of Acer rubrum, one of the country’s most successful shade trees. As the cultivar name suggests, Acer rubrum ‘October Glory’ is perhaps best noted for its exceptional fall color. A fast grower, it tops out at 40–50 feet tall with an oval rounded form. 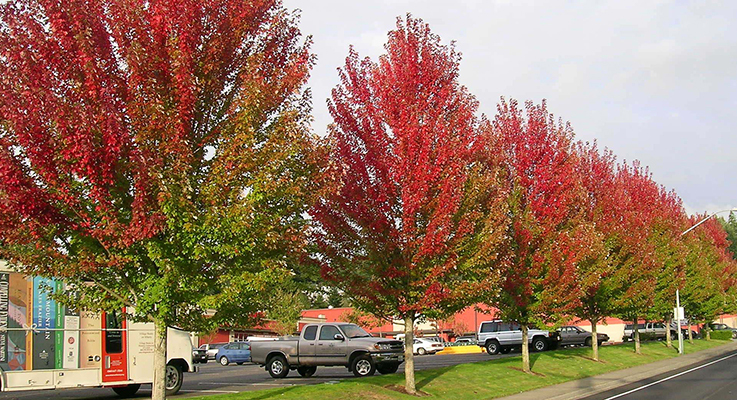 “Brilliant red maples span generations,” read an announcement from Oregon wholesale tree grower J. Frank Schmidt & Son Co. (JFS) earlier this year. For more than half a century, Acer rubrum cultivars and crosses have reigned as some the most widely planted, successful shade trees in almost every part of the country. Recognized by the U.S. Forest Service as the most common species of native tree in the United States, red maple also happens to be one of Oregon’s most lucrative crops. In fact, more red maples are grown commercially in Oregon than in any other state, and the 2014 USDA Census of Horticultural Specialties indicates that Oregon produces 24 percent of red maple trees on the American market. For JFS, 2016 marks a five-decade run since the introduction of its workhorse red maple, Red Sunset® (Acer rubrum ‘Franksred’) in 1966, and the single decade rise in popularity of a more recent JFS introduction, Redpointe Maple® (A. rubrum ‘Frank Jr.’ PP16769) in 2006. In that time, Redpointe — “a rising star on the urban tree horizon,” according to JFS Director of Communications Nancy Buley — has quickly surpassed Red Sunset as the nursery’s top-selling red maple. The newer selection impresses growers and designers alike with better heat and drought tolerance and better adaptability to a range of urban growing conditions. From the tree selection program at JFS run by now-retired Product Development Director Keith Warren, Redpointe maple was selected as an improvement over other trees on the market. “Redpointe is a growers’ tree,” Buley said. Bred for a strong central leader and upright habit, the hardy, low-maintenance Redpointe doesn’t take as much work for growers, she said. Redpointe boasts superior resistance to chlorosis in soils with high pH, a strong branch structure and amazing fall color. And the proof of its superior qualities comes from customers who are so impressed with the tree that they continue to order more. The company also is excited about the addition of Armstrong Gold (A. rubrum ‘JFS-KW78’ PP25301) to its list of introductions. Debuted in 2013, Armstrong Gold displays distinct differences from the original Armstrong, especially when viewed side by side. With better branch density, more compact form and better golden-orange fall color, Armstrong Gold is poised to move into the gallery of superior red maple introductions. The market for improved red maple cultivars has a long history. In 1946, Edward H. Scanlon, commissioner of shade trees for the City of Cleveland, Ohio, set the market in motion. Using budwood from a columnar red maple with ascending branches that was found growing at the Bowhall Nursery near Cleveland, Scanlon contracted with Handy Nursery Co. in Oregon to produce the Bowhall maple (A. rubrum ‘Scanlon’). Shortly thereafter, another maple joined the line of “Scanlon Tailored Trees.” The popular Armstrong maple (A. × freemanii ‘Armstrong’) dates to Scanlon’s efforts in the 1950s, when another locally discovered red maple with a narrow form was cloned and put into production. Then the floodgates opened, with the introduction in 1961 of October Glory® (A. rubrum ‘October Glory’) by Princeton Nurseries and Red Sunset by JFS in 1966. Counting numerous Acer rubrum cultivars and Acer × freemanii selections, which are crosses between red and silver maples (A. rubrum × A. saccharinum), Oregon growers offer dozens of options for a variety of climates, a variety of sites and a variety of shapes. All produce striking fall color. Even after all this time, the popularity of the early introductions continues, as demonstrated by listings in the forthcoming 2016–17 OAN Nursery Guide: 23 growers currently produce Bowhall as liners, in containers, bare root and B&B; 30 growers produce Armstrong; 29 growers offer October Glory, and 33 growers list Red Sunset. And the offerings have increased over time, as breeders at the U.S. National Arboretum, JFS and elsewhere have sought improved trees: using seed from local provenances to produce regionally appropriate options; identifying male trees for less mess produced by seed; seeking resistance to bugs and leaf chlorosis in high pH soils; demanding better branch structure and density; and even selecting for better fall color. Overall, some 50 red maples, including straight species and rootstock, appear in the OAN Nursery Guide, many of them with long records of successful use. “As liner growers, we like to offer a good array of cultivars so growers in other parts of the country can choose the ones most appropriate for their customers,” Buley said. A fourth named variety on the JFS announcement about generations of red maples was Sun Valley, a highly regarded seedless male clone from the U.S. National Arboretum. In more than two decades of use, Sun Valley has performed well from Michigan to Georgia, Alabama to Oregon. Its early, intensely red fall color and very uniform, densely branched oval head combined with significant resistance to potato leafhopper make Sun Valley another superior selection. “Own-root red maples produced by Oregon nurseries set the industry standard which all others follow,” according to Graham Anderson, general manager at Surface Nursery in Gresham, Oregon. “Oregon nurseries produce high-quality trees with great fibrous roots, straight trunks and well-branched tops. “Part of the success of Oregon growers has to do with successfully pioneering softwood rooting techniques for red maples in the 1970s followed by micro-propagation (tissue culture) in the 1980s,” he added. Perhaps more importantly, the climate here is especially favorable for the production of healthy red maples. “Other growing regions must deal with adverse temperature damage (extreme heat and/or cold) and serious insect damage (various borers, potato leafhoppers, mites, etc. ),” he said. Surface ships “distinctively uniform” bare-root red maple trees to both field and container growers and landscapers located mostly in the Eastern part of the country. The nursery offers immature whips with well-developed root systems (usually two years old) for field or container production, and branched trees (usually three years old) that have been pruned to improved forms with a straight central leader and radiating lateral branches. Besides cultivars grown by many nurseries, Surface is among a handful that offers ‘Fairview Flame’, which Anderson identifies as a vigorous tree that has great form with a dense, well-rounded head and spectacular scarlet fall foliage. Sester Farms in Gresham, Oregon, also produces an assortment of red maples. Jim Browne, whose sales territory for Sester Farms includes parts of the Midwest from Minnesota to Illinois and southern states from Arkansas to Florida, agreed that Oregon growers can get trees to market more quickly than growers in other parts of the country. Sester Farms supplies bare-root liners of red maples to caliper tree growers in sizes from 4-foot branched to 2-inch caliper, and they supply retail garden centers with containerized trees in sizes from #5 to #25. Customers also include re-wholesalers and landscapers. Red maples bring striking red fall foliage to parts of the country where the native flora doesn’t provide it. In the West, for instance, most natives produce yellow fall colors, Browne pointed out. In fact, uninformed westerners might think that “red maples” have red foliage, but the common and botanical names (Acer rubrum) of this Eastern native tree do not refer to the summer foliage, which is green. Rather, the red of “red maple” comes into play in the spring with red blooms that appear up and down stems before leaves, and again in the fall with red fall foliage. Both October Glory® and Red Sunset® have proven to be durable, dependable trees that produce great red fall foliage, and both are very popular, Browne confirmed. But sales depend a lot on specific criteria, including matching the size and shape of the tree to the site and its climate and conditions, he said. October Glory is well suited for landscapes in the hot-summer, mild winter South, “the standard for hot climates,” according to Nancy Buley of JFS, while Red Sunset has earned its reputation as versatile enough for the South, with better hardiness that makes it a winner for cooler climates. Another option for conditions in the South is ‘Summer Red’, Browne said, which Sester Farms offers as liners, in containers, bare root and B&B. For areas with extremely cold winters, Browne and Buley both recommend ‘Northwood’ (offered by five growers in the Nursery Guide) and ‘Autumn Flame’ (16 growers), both of which are derived from northern Minnesota seed sources. ‘Autumn Flame’, which was introduced in 1964 as a male tree by Oregon’s A. McGill & Sons Nursery, is said to turn red earlier in the fall and to tolerate wet soils. Buley also recommends Scarlet Sentinel® (A. rubrum ‘Scarsen’) and A. rubrum ‘Red Rocket’ for cold areas. Co-introduced by JFS, Scarlet Sentinel produces its best color in cold conditions. With strong upright branching, it is a good choice for streets and parking lots, she said. Acer × freemanii red maples include genetics from both red and silver maples (A. rubrum × A. saccharinum) and are said to benefit from the best attributes of both: solid structure, attractive form and showy fall color from the red maple and adaptability and rapid growth from the silver maple. Since such crosses can occur both by controlled propagation and naturally in the wild, the complexity of crosses and backcrosses can make identifying a Freeman maple challenging. Hence, some A. freemanii crosses are identified simply as Acer rubrum cultivars. These include Armstrong and Armstrong Gold, Scarlet Sentinel and Celebration. But the extremely popular Autumn Blaze red maple, which is listed by 36 growers, more than any other red maple in the OAN Nursery Guide, is identified as Acer × freemanii ‘Jeffersred’. Discovered in the 1960s by Glenn Jeffers of Jeffers Nursery in North Central Ohio, the upright, fast-growing tree quickly became the most popular of all red maple varieties, especially in fall when it erupts in a blaze of orange-red to scarlet-red fall foliage. Surface Nursery has added two Acer × freemanii cultivars, Autumn Fantasy® (Acer × freemanii ‘DTR 102’) and Celebration® (Acer × freemanii ‘Celebration’), to its lineup of maples for growers who are looking for alternatives to Autumn Blaze. According to Graham Anderson at Surface, Autumn Fantasy produces deeply lobed, rich green leaves with excellent bright ruby red fall color. Its ascending branches form a broad oval shape that resists crown damage due to wind or heavy snow loads, and it tolerates drought. Celebration boasts outstanding branch structure with strong crotch angles and limbs that are inwardly cupped to withstand wind and ice storms with no shattering. Seedless and disease resistant, the fast-growing tree forms a uniform pyramid, and its dense, deeply lobed green foliage turns red/orange to gold in the fall depending on weather and soil conditions. Poised to continue providing shade and coloring up properties across the country for generations to come, red maples from Oregon have a lot to recommend them.